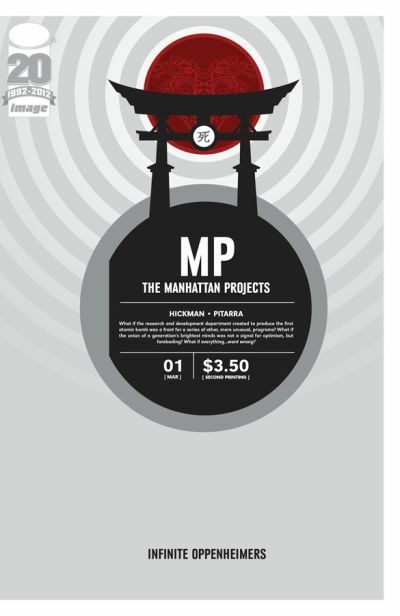 Jonathan Hickman’s return to independent comics, THE MANHATTAN PROJECTS #1, drawn by Nick Pitarra and Cris Peter and published by Image Comics, has sold out at the distributor level ahead of its in-store date of March 7. The issue will immediately go back to press and a second printing (JAN128125) will be in stores the same day as THE MANHATTAN PROJECTS #2 (FEB120509), April 4. Hickman previously created the Image comics THE RED WING, RED MASS FOR MARS, PAX ROMANA, and THE NIGHTLY NEWS, and his series SECRET will debut with Image on April 11. In THE MANHATTAN PROJECTS, he creates an alternate history in which the the U.S. government’s development of an atomic bomb is a front for bringing together the world’s brightest minds for something even more dangerous. The Second World War rages underground in ways the public can never imagine, and the men of The Manhattan Projects are the United States’ last and best defense against the supernatural forces of the Axis powers. THE MANHATTAN PROJECTS is a monthly, full-color comic book, available in comic book stores and multiple digital platforms.